November 1, 2017 – NASA has selected five U.S. companies to conduct four-month studies for a power and propulsion element that could be used as part of the deep space gateway concept. The agency is studying the gateway concept with U.S. industry and space station partners for potential future collaborations. These latest studies will help provide data on commercial capabilities as NASA defines objectives and requirements as well as help reduce risk for a new powerful and efficient solar electric propulsion (SEP) technology in deep space. NASA needs a 50-kW SEP system, which is three-times more powerful than the capabilities available today, for future human missions. 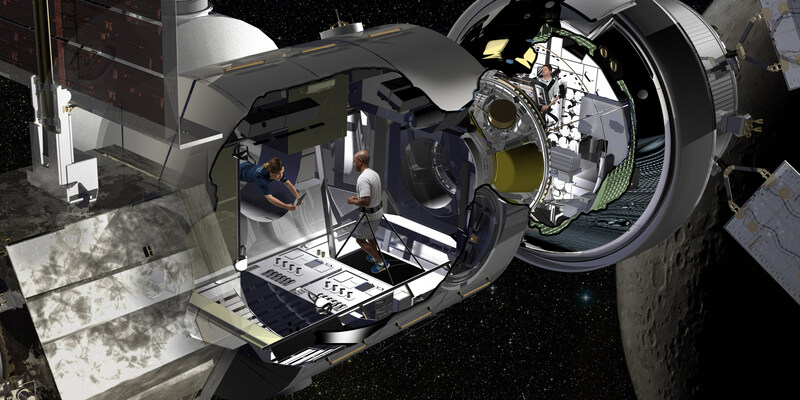 Earlier this year, NASA sought study proposals under Appendix C of the Next Space Technologies for Exploration Partnerships (NextSTEP) Broad Agency Announcement. The request identified 23 topic areas including potential commercial synergies to support development of a power and propulsion element. A new power and propulsion element will leverage advanced SEP technologies developed by NASA’s Space Technology Mission Directorate. An overarching objective of these studies is to understand the driving technical differences between prior SEP-powered mission concepts and potential new requirements for NASA’s deep space gateway concept.